Villa with pool on the outskirts of Lamalou les Bains. The main house has 3 bedrooms and attached is a apartment with one bedroom. Lamalou les Bains is located in the National Park of Haute Languedoc, a spa town surrounded by beautiful hills, countryside and vineyards. The area is fantastic for walks, swimming and canoeing whilst the beach is 45 minutes away. The villa is on the edge of the town so restaurants, shops and even the casino are within walking distance. The villa was purchased by Chris Newman as a holiday home in March 2011. The location is wonderful in that a short walk can take you to the wooded mountains of Languedoc National Park in one direction or the spa town of Lamalou les Bains the opposite direction. Having viewed many properties this was the place to be. After lots of painting and decorating and 2 newly fitted bathrooms the house was completed in June. We plan to visit several times each year-Beziers airport is a real benefit as it is so close. We have a local English couple who do the maintenance and changeovers whilst the swimming pool is regularly maintained during the summer months. A holiday here can be as quiet or busy as you want it to be. The Med' beaches of Valras Plage and Cap d'Agde are about 40 minutes away as are several historic cathedral cities such as Beziers and Narbonne. Nearer are vast areas of vineyards as well as spectacular mountains. Great for all outdoor pursuits. Lamalou is a busy town in the summer months but the location is still very peaceful. The first impression of the villa is the stunning mountain views you have from many of the rooms as well as the swimming pool area. A favourite place is the sun terrace which is secluded and in the shade. There is a large dining table here or you can eat by the barbecue terrace. The villa is all on one level with the appartment lower down with a separate entrance and facilities. The drive through the main gate can accommodate several cars though originally this was designed as an area to play 'boule'. The garden is secure and private with sun bathing and shaded areas. Bathroom in the main house has twin basin, large bath with shower heated towel rail and separate toilet. The apartment has shower enclosure basin and toilet. The living room has 2 sofas, wood burner, TV with free UK satellite channels. The dining area has a large table, 6 chairs cupboards and doors to front terrace. Wifi. Fitted kitchen has hob and oven. A large fridge freezer, dishwasher, microwave, double basin, toaster, and kettle. Plus great window views. Lamalou 9 hole golf course is 5 minutes away. Outside: The villa includes a terrace outside the dining room, swimming pool with loungers and a built in barbecue gardens and ample parking. Utility Room: The utility area is within the garage and includes a washing machine. Cleaning / Towels / Linen / Maid service: Towels and linen are included. The property is cleaned at changeover. Other: The apartment has twin beds, shower room, and lounge / dining room including kitchen. Lovely house situated on the edge of the town with beautiful views of the mountains. We had a relaxing time in Lamalou days were busy though during the winter the town is quiet at night. House was warm and comfortable with the woodburner on and a bottle of local wine. Recommend Pezenas for a good day out. Great location with fabulous views across the hills but also close to the town centre. 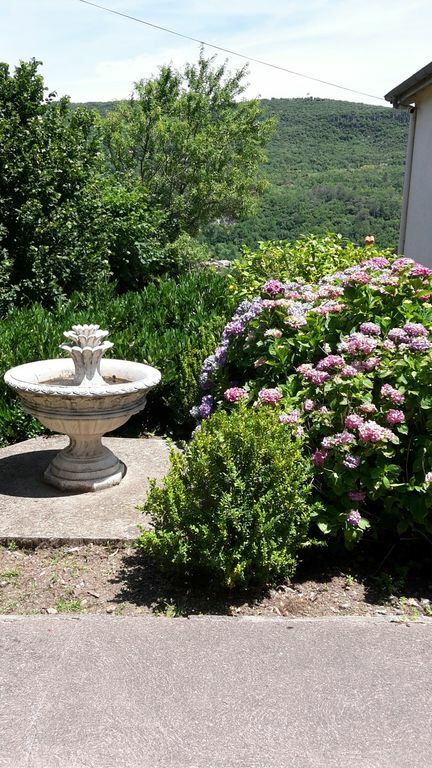 The house is located in an area where you are within the National park with hill and river walks but also close to the vineyards and the coast. Lamalou has several restaurants and bars the best one being Petite Abbey, but closed early part of the week, quite steep if walking back.Good warm sheltered area by the pool and the apartment, house is more spacious. De part sa situation dominant la vallée et son exposition vis à vis du soleil, c'est un endroit de choix pour des vacances en période où vous pouvez profitez de la piscine. Ceci étant, la maison reste sobre et fonctionnelle pour quatre personnes (non compris le studio indépendant). Nous avons pu faire une petite flambée dans le poêle un jour un peu frais, ce fut sympathique et ludique. La maison a un jardin périphérique bien pratique et elle est facile d'accès depuis le Bourg de Lamalou les Bains. Le chauffage gaz fonctionne très bien et le confort durant notre séjour de trois semaines (octobre - début novembre) a été parfait. Pour finir, j'ai eu la plaisir de rencontrer Mr Chris Newman qui est un personne très arrangeante et que je remercie encore pour sa collaboration avant, durant et après cette location. This location is split in a main house for 6 and a separate apartment for 2, both have their own entrance and are quite separated, so actually you rent a house for 6. The house is according the description, but needs some general renovation, e.g. some broken tiles, broken wind hooks and painting. In total only 2 towels per person are provided for a whole week, and only 1 towel for the kitchen. There is a washing machine, but to our opinion and experiences this is low - for sure in relation to the price of the house. The furniture - inside and outside - is poor if you are with a party of 8. Great views, good pool in great atmosphere of the Languedoc. Easy to walk to nearby village with shops and restaurants. At the end of the summer we carry out maintenance for each room, it is not always possible to repair damages or replace during mid season. There are two towels available per person but the washing machine can be used if needed both for towels or any other clothes. There are beaches approximately 45 minutes drive away. The nearest airport is Beziers about 30 minutes drive. Car hire is recommended though Lamalou is within walking distance and has many amenities. There is a bus service to Beziers and Montpellier. Lamalou is less than 10 minutes walk. Lamalou has many shops, a market, bars, restaurants and a local sports centre which includes tennis and swimming. There is also a casino and cinema. Booking Notes: Book through owner, a 10% deposit is required and payment 2 weeks before arrival. Changeover Day: Changeover day Saturday though there is some flexibility.